Nestled in the woods...but literally just two minutes from US-10...is a unique but functional home that most people don't realize exists. 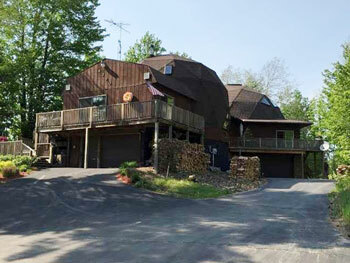 Now's your chance to view this double geodesic dome house, as the owners have decided to put it on the market. Geodesic dome homes started popping up in the 1970s as a different yet energy-efficient way to live. Buckminster Fuller developed the idea of domes, which are comprised of a series of triangles, hexagons and pentagons. Each board is bolted into a steel "hub" and is put together like an erector set. The structure, built from a kit that you can purchase from a dome company, is free-standing and requires no inner walls. Many people can build their own domes with little or no construction experience, and the shell can be put up in a day or two.Though most people will build walls to close off rooms, the dome could be free-standing and allow for open space. As there are no "corners" in a round dome structure, heat circulates freely around the house, making it more energy efficient. Also it's been proven that the more pressure you put on the outside of the dome, the stronger it becomes. Domes have withstood hurricanes and tornadoes with very little damage. Without the need for inner wall support, the design of the interior can be anything you'd like it to be. Most dome companies also sell triangle skylights, which allows light to enter the dome and gives it an open and spacious feeling. This dome, located at 4390 W. 1st Street, has come a long way since its humble beginnings. The owner, John, built the first dome himself in the early 1980s...cutting every strut and piece of plywood. Once it was complete, John got a job offer to work overseas for the State Department, so he and his wife Diane moved and rented the dome out for a couple years. After that they left it empty and lived there during summer breaks home. When they came back to the States for good, there were two more in the family, and John and Diane felt that the first dome was not big enough. So they decided to clear the land in back, and purchased a kit for Dome #2. It was finished in 2005, and over the next few years, improvements were made to Dome #1...including an entire new kitchen, new deck, and tile in both bathrooms. The kids are now grown and the house is simply too big for John and Diane. The difficult decision was made to sell it and downsize. They both have an emotional attachment to the domes, as the entire family worked on them. Both domes have a combined 4,300 square feet (6,000 including basements and garages). The front dome, referred to as Dome #1, features a large kitchen in the front of the house with two patio doors, two entryways and a nice island with cooktop. Hickory cabinets and Corian countertops give this room a fresh, updated look. 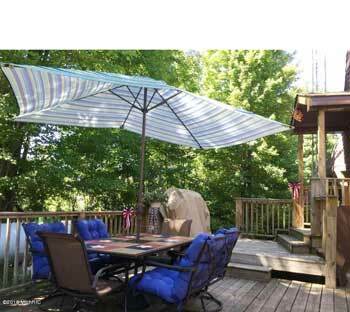 A foyer leads out to the side deck, which is large enough for a big patio table and grill. It looks out over a wooded area and is very peaceful. 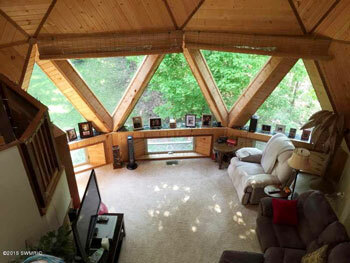 Also in Dome #1 is a dining/living room with three beautiful triangle windows. Off this room is a full bath and bedroom, and upstairs you'll find another bedroom, large full bath and a loft area with walk-in closet. Head down the hallway to Dome #2 and you'll find a nice laundry room to your left, large enough to also hold another refrigerator...and a coat closet to your right. Then you enter the large family room that's open all the way to the top of the dome. 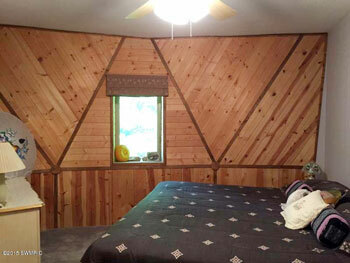 Walls are covered with beautiful pine panels, highlighting the triangles, pentagons and hexagons. One end of the family room features five large triangle windows...allowing you to view the outdoors from any angle. 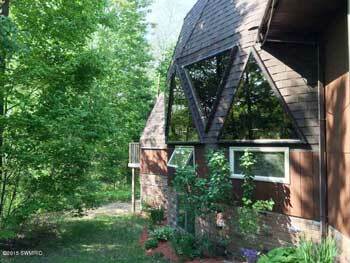 The other end has one triangle window that overlooks another deck, accessible by a patio door. Near the back is one cozy bedroom and a black and white fully tiled bath with walk in shower. The master suite also has a triangle window that looks off into the back woods and another deck with patio door, plus a walk-in closet. 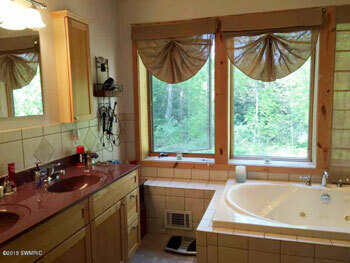 The tiled master bath features two sinks, a deep jetted tub big enough for two and a walk-in shower with built-in bench. Four large windows face the back wooded area. From the family room you can take steps up to the loft, with a "bridge" that crosses over to the main area. This is an unfinished area....all open....so possibilities are endless with this space. There are three sets of two triangle skylights, so it's well lit and very spacious. Head down to the basement of Dome #2 and you'll find a gas furnace room and space in the garage for three cars. Off the garage is a workshop and an exercise room. Dome #1 basement has a wood-burning furnace and a garage with room for one car. It truly is a spectacular home with plenty of space for a family of four or larger. It would also make an ideal vacation home for two families. It's different....yet once you're inside, you'll discover that it's not "weird" in any way. For more information on this double-dome home, contact Debby Stevenson with Greenridge Realty at (231) 510-5727 or click here.